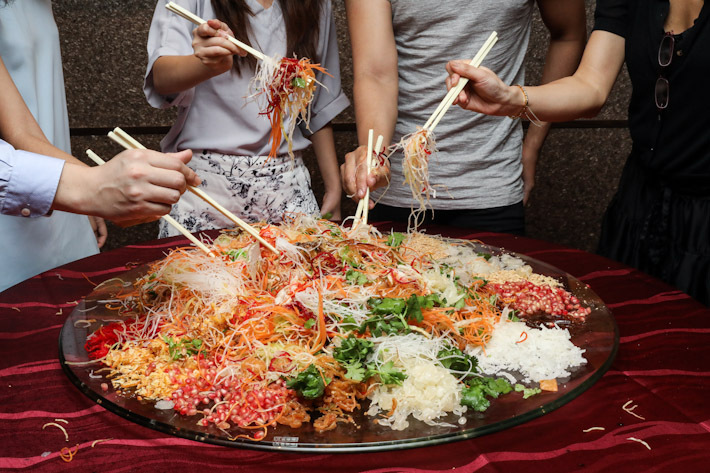 No Chinese New Year would be complete without a prosperity toss or Lo Hei. Seen at literally every reunion meal, this iconic salad dish of technicolour beauty symbolises starting the new year on a good note. Traditionally, salmon slices are used but Ginger raises the bar this year with their Prosperity Lo Hei with Boston Lobsters that introduces luscious, plump lobster meat as well as a myriad of ingredients not commonly found in your typical yu sheng; think ingredients such as pomegranate, jellyfish, deep-fried and salmon skin. 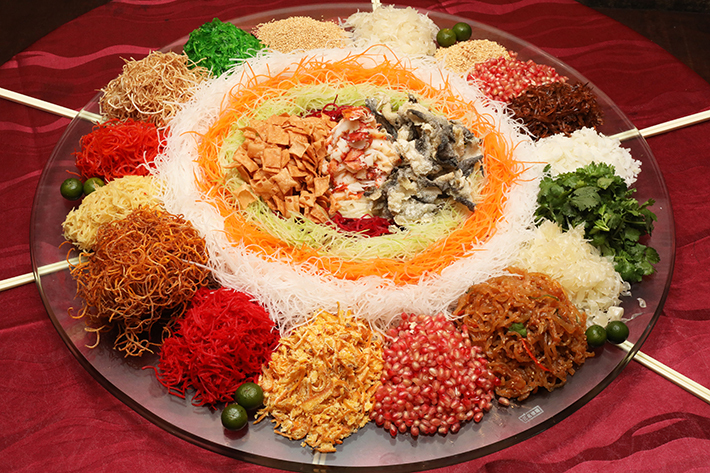 Taking the idea of reunion dinners to a whole new level, each table will enjoy one complimentary serving of the Prosperity Trio during the dinner buffet that comprises this extravagant Lo Hei, as well as a serving of the Braised Sea Treasures and Wok-Fried Lobsters In Superior Stock—no minimum number of persons required! Not many know about this, but back in the olden days, Pen Cai was a dish strictly meant for royalty—more specifically the emperor during the Song Dynasty. Now a mainstay in many Chinese restaurants, this braised treasure pot of goodness is something anyone can enjoy. Boasting premium ingredients such as baby abalone, sea cucumber, fresh scallops, fish maw, dried oysters and wawa vegetables, Ginger’s Braised Sea Treasures is so luxurious, rich and will definitely impress everyone in the family. The Wok Fried Lobsters in Superior Stock, (available only as part of the exclusive Prosperity Trio served during the dinner buffet), is a crustacean enthusiast’s dream come true. Fried with ginger and scallions, the plump lobsters achieve a clean and fragrant aroma that does not overpower the natural sweetness of the crustacean. Once fried to a golden shade, it is further intensified with a savoury stock. Each piece of lobster that we had was tender and oozing with savoury flavours. On the outside, you get a mildly caramelised exterior with subtle hints of wok hei and on the inside, the flesh was still soft and sweet. Given the expertise of our friend, Executive Chef Low Hoe Kiat, in Asian cooking, Ginger will offer a wide variety of traditional delicacies to usher in the auspicious year. Debuting on the buffet line is the Golden Sea Bass with Sha Cha Sauce which is deep-fried whole. The deep-fried fish boasts a crispy exterior and delicate meat that is brought to life with the addition of the savoury sha sha sauce—a traditional Teochew condiment comprising soybean oil, garlic, shallots, chilis, and dried shrimp. 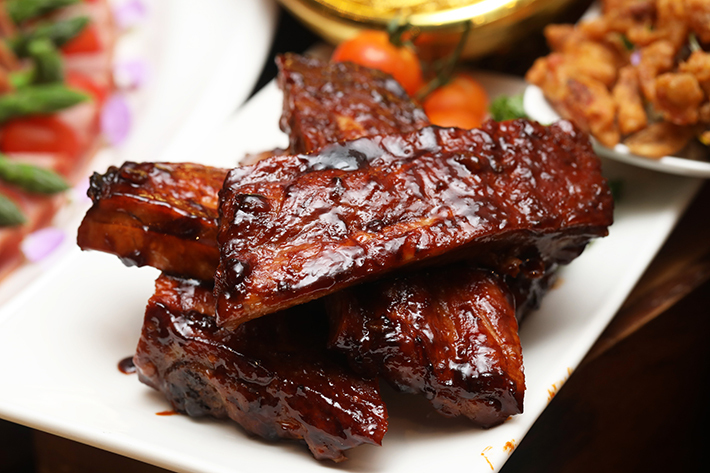 If there was any way to describe perfection in a bite, their Barbecued Pork Ribs in Capital Sauce would be it. Sticky, sweet and complete with a charred and smoky quality, this lean pork rib is hands down, a winner in our book. One of the newer highlights of Ginger’s extensive buffet spread is Chef Low’s signature Baked River Prawns with Garlic Shoyu, a tantalising treat that boasts succulent textures in every bite. The garlic and shoyu combination play a profound role in this dish which complements the natural sweetness of the river prawns excellently. 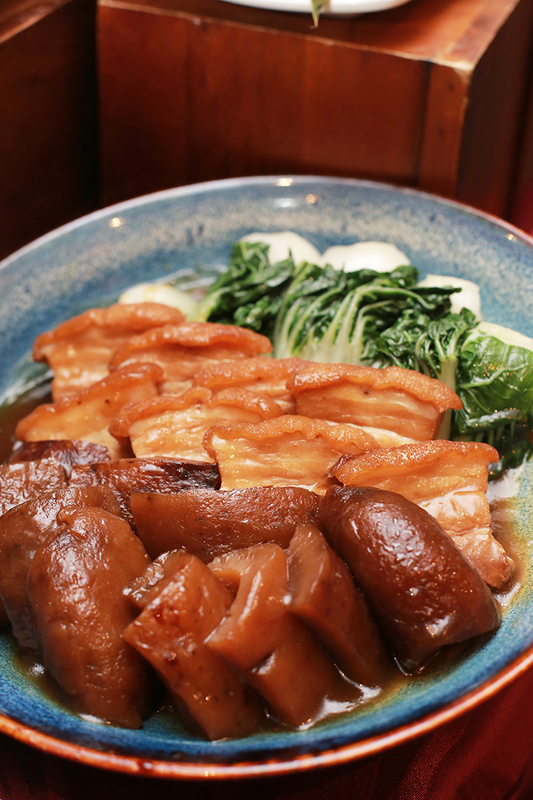 Another new addition to the buffet line-up is the new Braised Sea Cucumber with Treasures that features sumptuous and chunky braised sea cucumber, pork belly and vegetables. Although we are not huge fans of sea cucumber, we must say that the ones here are braised beautifully. Last but most certainly not least, is this stellar fried chicken dish that is bound to have you going back for seconds or even thirds. 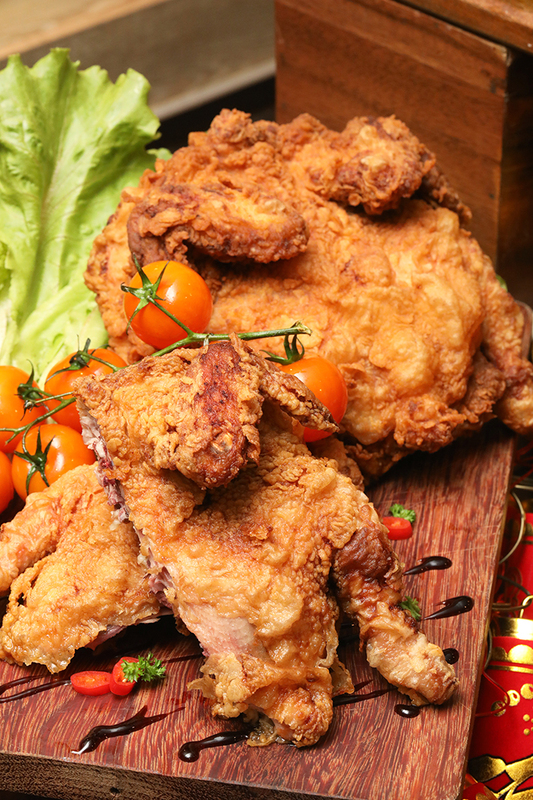 Lightly battered and fried whole, the chicken is insanely crispy with a flavour closely resembling that of our favourite Har Cheong Gai. 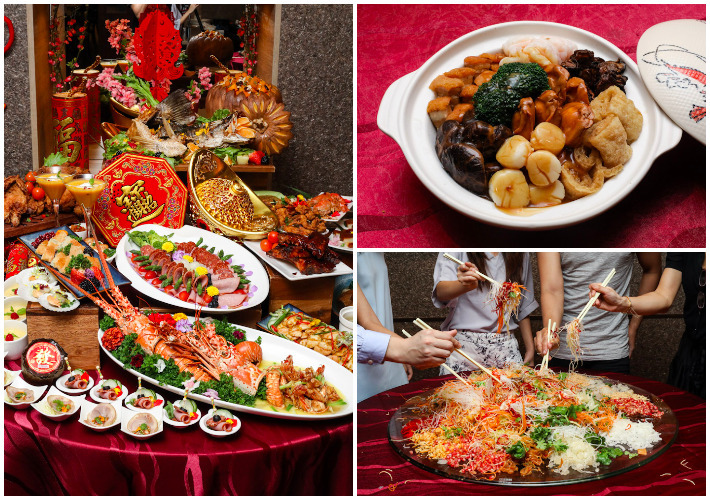 Don’t forget to quote ‘ladyironchef x Ginger CNY’ to enjoy 25% savings for both the dinner and lunch buffet. That means you only pay S$36++ per adult for the lunch buffet and S$58.50++ for the dinner buffet. **Offer is valid from 5 February to 2 March 2018. **Offer is valid from Mondays to Sundays. **Offer is not valid during Eve of and on Day of Public Holidays. **Blackout dates on 15 February 2018, 16 February 2018 and 17 February 2018 apply. **Prior reservation is highly recommended and subject to availability. **Offer cannot be combined with any other promotions, offers or vouchers. **Prices are subject to service charge and Goods and Services Tax (GST). **Prosperity Trio is served exclusively during the dinner buffet. **Prosperity Trio is customised to suit the number of guests per table and limited to one serving only. **The hotel reserves the right to amend promotional details without prior notice. WOW…ALL THE WONDERFUK DISHES FOR CNY 2018, cheers! Hiee, any1 went for e Dinner buffet? Any feedback? Plan to go with my family this sunday .. Thank you ..